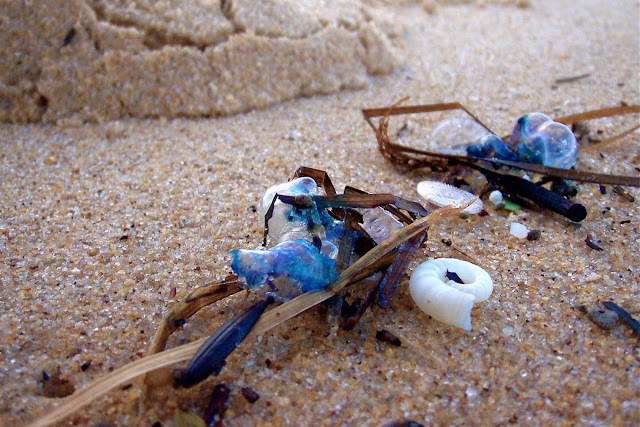 I have noticed reference to "bluebottles" in many different context, but here on the coast they aren't an annoying little insect, rather they are a hazardous form of jelly fish that sometimes appear in numbers after a long spell of north-easterly breezes. They have a lovely translucent blue "bubble" which keeps them afloat, and sails them before the breeze, but sadly for those who come in contact with them, they trail tentacles loaded with nasty stinging poison. While not fatal, the sting can range from uncomfortable to needing treatment in hospital. When they are in numbers, they wash ashore in numbers. Wow! I have never heard of or seen these jellies before. Can you see them when they are out in the water? Yuk, after yesterday's lovely pic you reminded me of the nasties in the sea. An odd angle which took me a few seconds to see past. Also, I recall you posted a piccie of a supermarket trolley encrusted with limpets. I'm writing a blog-post on marine animals using rubbish as a habitat, and think it would be perfect. Would I be able to use it? I would credit you. And could you remind me where to find it?